Artisan Soap Sandalwood - Bigfoot Trading Co.
A light, but rich and exotic fragrance of sandalwood. Mysterious, deep blend of sandalwood with cedarwood and musk with hints of jasmine and gardenia. A customer favourite! 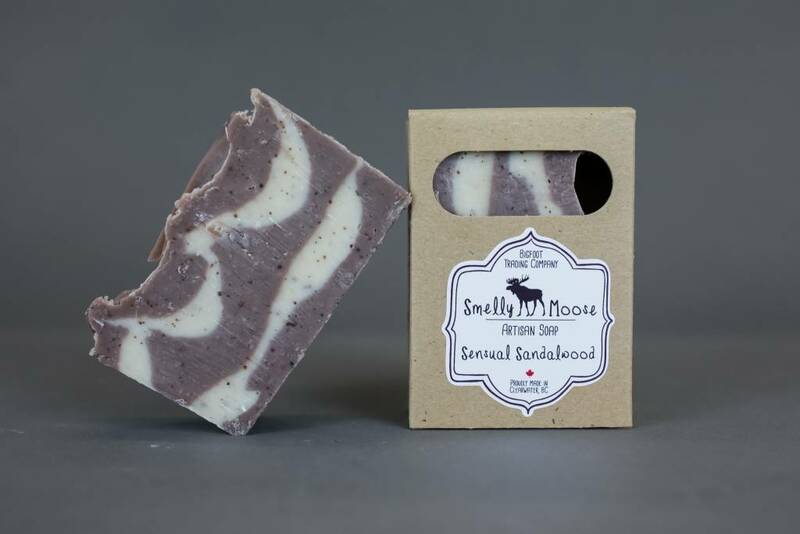 Our Smelly Moose Soap is filled with carefully chosen quality oils and butters and always made in small batches. All our soap batches are cut by hand so there can be some variation in sizing, but all bars are guaranteed to be at least 3oz in size. Please note that there can be differences in colouring from batch to batch (we chalk it up to artistic license!). We obtain our palm oil from a certified sustainable source, but due to the issues around palm oil usage, we are reducing our usage of palm oil in our soaps. In it's place, we are using locally sourced, ethically raised lard which we render. Please see the ingredient listing for each soap to see which product is included.